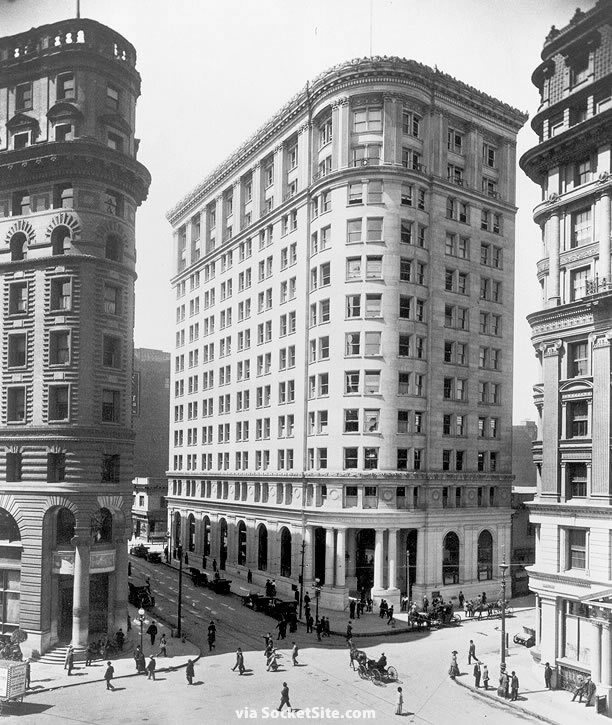 A twelve story building designed by Willis Polk for the First National Bank of San Francisco, which was acquired by Crocker National Bank, was constructed on San Francisco’s 1 Montgomery Street parcel, at the corner of Post, back in 1908. And in 1921, a two-story addition was constructed on the 25 Montgomery Street parcel to the north, designed by Charles Gottschalk to replicate the style of Polk’s design. In the 1960’s, “over concerns that the original sandstone facade was in poor condition,” the top ten floors of Polk’s building were remodeled by Milton Pflueger in a contemporary aesthetic. 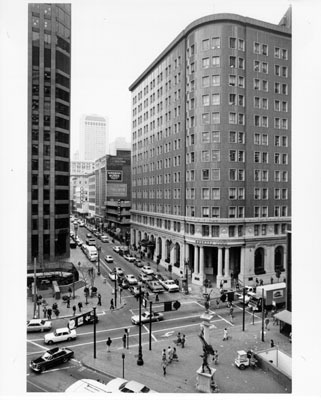 In the early 1980’s, the top ten floors of 1 Montgomery were then removed in conjunction with the development of the adjacent Crocker Galleria and the 500-foot-tall tower at the corner of Post and Kearny, which is technically 120 Kearny but was branded “One Montgomery,” at which point the rooftop of the Crocker Bank building was converted into a privately-owned public open space (POPOS). And it’s atop the surviving two-story bank building on the corner that a 500-foot-tall tower is now proposed to rise. The open space is a public open space, not a private open space, privately owned and maintained. 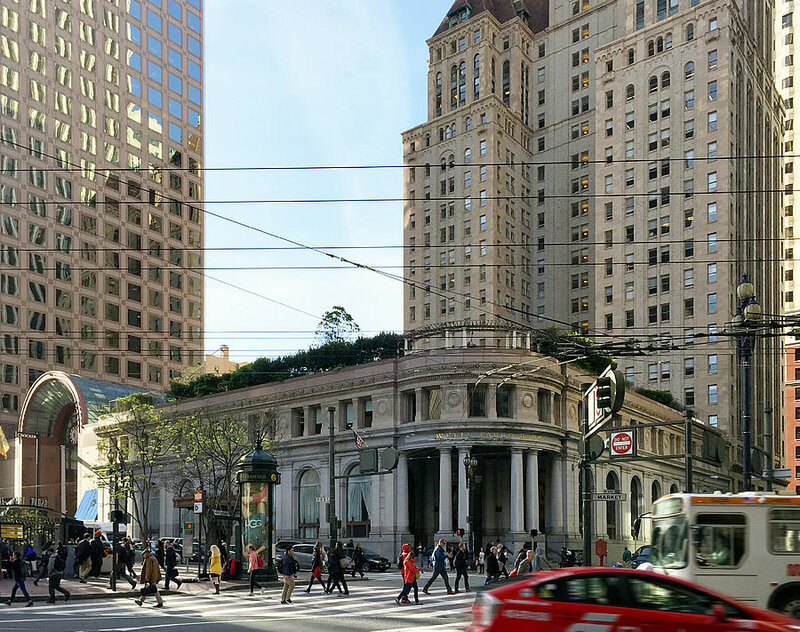 The high-rise at Crocker Galleria was allowed to exceed the current height limit in exchange for removing 10 floors of the building on the corner for a public open space and sunlight. When the high-rise was complete, the owner tried to back out of removing the 10 floors, but the City of San Francisco held them to their agreement and the floors were removed. A new high rise on public open space, privately owned and maintained, should not be allowed unless the Owner provides the City with some other amenity of equal value. An amenity of equal value like, say, expanding the public open space? Like they’re proposing? “The high-rise at Crocker Galleria was allowed to exceed the current height limit in exchange for removing 10 floors of the building on the corner.” It’s pretty clear that the later half of the 20th century will go down as the most awful era in urban planning history. Wow, what a BS reason. Yes, the latter half of the 20th century (and possibly the beginning of the 21st) should be a history lesson to future generations. Unfortunately a lot of the damage has been and is still being done. Rule of Law and keeping your word – the canons of both the Right and Left – how quaint! I actually think this (existing composition) works rather well, both architecturally and functionally (you omitted mention of the similar POS on the west and the fact that the Galleria was a sub for the lost ROW of Lick Place); it’s true it would have been nice if the trio of rounded-corner buildings could have been kept intact, but the other two were long gone by 1980 (see below), and even before that the refacing destroyed much of the character of this building. If you look at the link to the article describing the proposal, you would see the current open space would not no be diminished, and it would actually be expanded by 6,500 square feet. The new tower is being built off to the side of the existing open space. So, the open space is a non-issue. Such a shame they didn’t keep the original structure, but that’s the past. Given the present 500ish ft platuea in that area they should build it 700ft or so… Or 900. It’s not that much into the past. You’d think by the 80s we’d be smart enough to retain buildings like these. Of course in the 80s we were still building a boat load of Richmond District Specials. I still want to know the justification for removing the original portion. I’d love to see a pic of the building condition after the 1960’s “modernization”. I might feel less bad that the ten floors were removed. I haven’t really looked closely at the plan, but it appears that the new building will be almost directly west of the POPOS. Before I would be supportive I would want to see some shadow studies showing that the the new building isn’t a problem for lunchtime sunlight to the POPOS…but it appears it shouldn’t be since the southern exposure isn’t compromised. That POPOS is very well used and is a great respite downtown, regardless of what was originally on the site. Link to the the building condition after the 1960’s “modernization” (in the article above). Although re-clad, there is no reason it could’ve have been restored properly to it’s original aesthetic (excluding cost, of course). Another image of the re-clad exterior. You can still see the Union Trust Building on the right. What a damn pity we lost these. While we’re dreaming, we could start with a historic restoration of the Call Building, too. Now that was a handsome building. That intersection looked better in the day than it does today. Personally I prefer classic architecture. The attention to detail, roof treatments and all are visually more appealing. Given the history of why the top stories were taken down, it seems a violation of the spirit if not the letter of the deal to now plunk down a tower on top of the building. 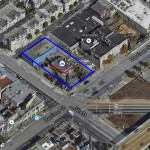 Can’t the developer find another location along Kearny or whatever on which to build this project? Hopefully the up-zoning will not be granted. So, are you suggesting that the needs of the city aren’t allowed to change over time as the population grows? Whatever idea was implemented at one time isn’t allowed to adapt to changing realities? This is hardly about the needs of the city. This is a speculative development, not a new bus stop. The entirety of San Francisco is a speculative development. It would be better if they just rebuilt the original part they lopped off. I still have no idea why they chose to do that in 1980s. Then again, not a lot of good things happened in the 1980s (architecturally, fashion, etc). Does anyone know why the two other buildings in the photo were demolished? The Crocker Bldg (on the left, c 1890) was demolished for the Mc Kesson Bldg in 1968. The Union Trust Building (on the right, c1895, 1904 expansion) was torn down for the Wells Fargo Bldg – SF’s tallest when built …height !! density!!! – in 1964. A good example of an architectural ensemble, and how each demolition became an excuse for the next, on the grounds that it wasn’t whole anymore. What an absolute pity that we lost those. I’m still baffled at the thought process that went on in the 1960s. I’m guessing it was all the momentum from Urban Renewal a decade prior. What a terrible time in architecture (not much better now). It’s especially true for SF because of how bereft we are of late 19th Century commercial architecture due to the 1906 quake. Every time I visit Denver, Portland, Seattle or Vancouver, I weep a little at the thought of the lost heritage. RE : the 80s, you missed politically. The “Reagan Revolution” marked the start of the demise of what was a fairly decent country. Look at the proposal. They would NOT remove the open space (the tower would be built off to the side), and they would actually expand the existing open space by 6,500 square feet. So, there is no issue with the open space. The spirit of the deal was based on certain ideas and zoning plans at the time. This is certainly against that spirit, but it’s 35 years later. San Francisco’s downtown, and urban planning in general, are different than they were in 1980. I am not sure the proposal would violate the deal either in spirit or legally. The open space under the proposal would not only be preserved, it would be significantly expanded. Also, my understanding is that while the city did enter into a deal with the developers of the original tower to have the upper floors of the old Crocker Bank building removed for open space, the developers were happy to comply because the old building would have required a very expensive seismic retrofit to keep it open. Thanks for the interesting post. The evolution of this site is quite interesting. In simple land use parlance, it is called backsliding when you repeatedly cull through and renegotiate mitigations and public benefits. Government’s track record of protecting such benefits against their degradation and ultimate loss is particularly bad. Hence the reluctance to consider such modifications, even when the new proposed gimmes are all shiny. All three of the buildings in that top photo are gone, which is a shame. I would support the rebuilding of the original ten floors that were removed. Instead of filling out the entirety of the original footprint, the rear facing the Galleria could be stepped back to preserve some more sunlight. The office space will be built, open space and sunlight preserved, and the street corner is strengthened architecturally. it’s a win-win-win. Actually, the building was built for the First National Bank of San Francisco. Crocker National Bank was across the street where the McKesson Building is today. 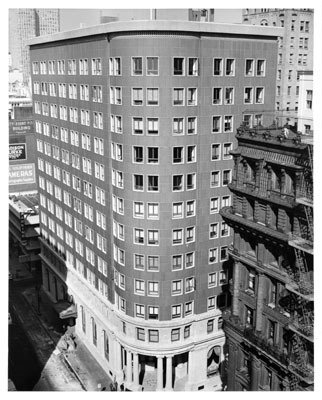 When Crocker bought First National Bank, it moved into the FNB San Francisco HQ and became Crocker First National Bank. 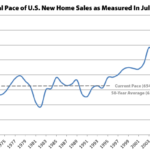 A problem with old office occupancy highrises of the early 20th century is the floor to floor height. If you look closely at the pictures of the original buildings in the historic photos above, you see that the windows were double hung wood windows, much like the residential structures of that era. There was no air conditioning, and heating would have been by irregularly spaced radiators. That was the state of the art for the era. The only thing in or on the ceiling were the light fixtures and hopefully, the fire sprinkler system. This allowed for relatively short floor to floor heights that managed to yield pleasantly high ceiling heights. After World War 2, the new state of the art was forced air HVAC systems fed by ductwork above the ceilings providing both heated and chilled air. New buildings would account for this with higher floor to floor heights even when the average finished ceiling height stayed the same or even began to shrink – hello 8 foot ceilings. Retro-fitting many of these old buildings could result in un-sellable ceiling heights, so they were often left alone and began to decline as desirable business addresses when compared to the new steel and glass highrise across the street. Another problem was elevators. Those old building often didn’t have too many, and the culture still allowed for taking stairs between floors. New buildings were taller, with plenty of elevators, and no one ever took the stairs except for the annual fire drill. Combine this with often insufficient numbers and arrangement of stairways (Including buildings like the original buildings in the historic photos above that often relied on fire escapes) and the difficulties of keeping these old buildings market ready could become impossible to solve. I am preservationist in my feelings for old buildings and love that the Flood family have maintained the Flood building as a museum of Victorian office building standards, but I can appreciate, while not likeing, why so many old buildings like these were taken down. Good post with interesting points. It’s too bad that we didn’t arrive at ductless or small duct HVAC systems (for instance, the SpacePak or Unico). These could have helped remedy the issue with retrofitting modern HVAC systems where space was limited. Aside from the Flood building, there are still many more turn-of-the-century office buildings (Russ, Phelan, Humboldt Bank, Matson, PG&E, Pacific Bell, Shell), and they manage to do just fine. And a couple, the Mutual Savings Bldg. and Central Tower that didn’t fare so well. Central Tower definitely got the short end of the stick (still wish it looked like it when it was the Call Building). Did anything happen to the Mutual Savings Building aside from the modern addition to the left of it? Modern guts would be odd. Isn’t the lobby right now art deco? By guts, I was thinking HVAC, DAS, fire/life-safety, elevators, stairs, LEED platinum, etc. + restored lobby. Ah thanks for clarifying. Yes, in that case modern guts are good. I’m hopeful for the Call Tower, but not holding my breath given the pace of things. Yes, hail to the Flood family. And it’s kinda cool that they are still around as well. I highly recommend looking at the bank safe in the lower level. It is a work of art unlike anything that will ever be made again. That and 1 Powell Street are two of my favorite buildings in SF. The new development should go up to at least 600 ft! If this is public open space as mentioned above, as opposed to POPOS, I am surprised the code allows it to be built upon. Are there examples of other public open space that has been developed in a similar fashion? Where are the additional 6500 square feet of open space being fit into this project? Architecture aside, the mid-rise nature of that corner is an example of why some wish San Francisco had been kept mid-rise (up to 20 stories) as some European cities have basically remained. What is done is done, but a lot of the opposition to the further up-zoning of parts of SF comes from a belief the City should retain its remaining low-rise cityscape. About half of the existing rooftop is blocked off to the public. If they open it up, it’ll net additional POPOS square footage. Had a feeling they were trying to pull a fast one on us by hoping nobody would be around to remember. Make your voices heard. Your comment makes no sense. No one is “trying to pull a fast one.” Any proposed building would have to go through the normal approval process, just like any building, and that usually takes several years, even under the best of circumstances. Also, the new proposal includes the same amount of open space, so there would be no issue related to the current existing open space. I suspect the project will ultimately get approved. The real issue is whether it will be able to get financing to actually get built. I really love the original 1908 building. It really is a shame they “modernized” it in the 60’s and didn’t restore it. Now, it will be built up again with a modern structure, mixing the two architectural styles. Really folks? When are we going to stop this Las Vegas refurbishing of our architectural treasures? No to re-re-purposeing. I love the old photo of the three buildings with their curved facades at the intersection and their beautiful facades. And, I really love the open space that now exists. Corner lots are especially important spaces in a city and that fact that it is only a few stories tall with open space on the top makes this area very unique. I am getting really tired of gimmicky projects in this city. Don’t waste our time. It’s insulting.